You’ll see that places like Michigan’s Upper Peninsula that normally are buried under 2 feet of snow this time of year, have barely seen an inch. Despite all the news coverage about blizzards in Colorado, this past December really was exceptionally warm, with temps running on average of 5-20 degrees above normal. 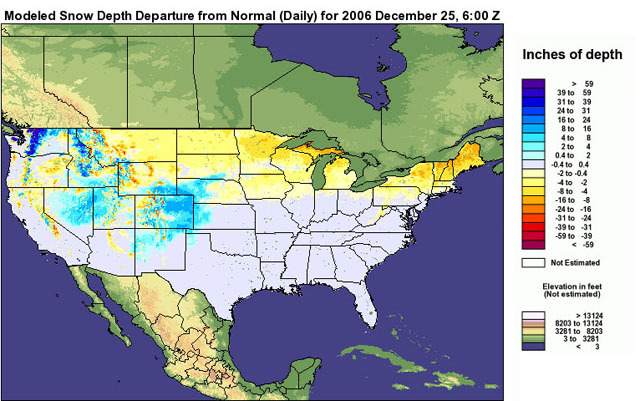 But warm winters happen, and although they have been happening a lot more recently, this winter seems different. The earth has a way of balancing things out, so as it is exceptionally warm in one place like it has been here, it usually is exceptionally cool in another place (like Europe or Russia). no cold Arctic air to be found. Why is this scary, and potentially dangerous to have such warm winters? the Arctic that retards the formation of the usual cold air masses over the adjacent regions of Canada and Siberia… the record low sea ice in the Arctic is probably a significant contributor to this winter’s record warmth. I expect that the unnaturally warm winters we’ve experienced the past two years in the U.S. will become the norm ten years from now–and may already be the new norm. I know I’ve been posting a lot about the excessive warmth we’ve seen this winter, but I can’t really believe it. I’ve only been a “weather geek,” for about 15 years but I do know for sure that there certainly has been nothing like this since I’ve been alive, and most likely since anyone reading this has been alive. It seems to me that climate change is not going to be something that happens gradually over hundreds of years, but more likely something that happens very quickly in a rapid chain reaction. The melting of the Artic ice caps is happening and will (as mentioned above) prevent normal cooling in winters, which will melt more ice caps more quickly, which will mean warmer winters, which will melt more ice caps even more quickly…etc. It appears to be happening. I guess the obvious question I need to ask myself is, what can I do personally to make a difference? This entry was posted in Uncategorized. Tagged climate change, nyc, weather.